A new IMF paper develops an analytical framework using bank lending survey data to investigate the effectiveness of macroprudential measures in containing housing booms in the euro area, the channels of transmission of such measures and their interaction with monetary policy. The authors findings suggest that macro-prudential instruments targeting the cost of bank capital would be effective in slowing down mortgage credit growth, and given similar channels of transmission, would reinforce the impact of monetary policy tightening. 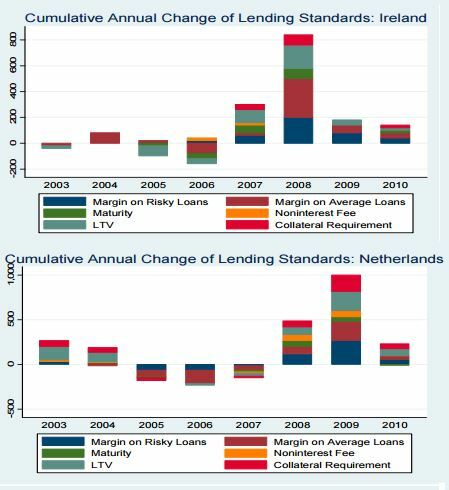 Limits on loan-to-value ratios are also effective in containing housing booms, especially when monetary policy is excessively loose, and can therefore complement macro-prudential instruments affecting the cost of bank capital.